If you're reading this, There's a good chance you've wasted enough energy to boil a kettle of water to get here. A recent study by Harvard shows Googling is putting tons of CO2 into the air. 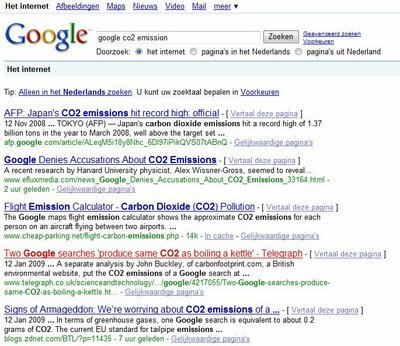 A typical search through the online giant's website is thought to generate about 7g of carbon dioxide. Boiling a kettle produces about 15g. The emissions are caused both by the electricity required to power a user's computer and send their request to servers around the world. Websites with complex video can be responsible for up to 0.2 g per second, he believes. On his website, CO2stats.com, Dr Wissner-Gross wrote: "Websites are provided by servers and are viewed by visitors' computers that are connected via networks." "These servers, clients and networks all require electricity in order to run, electricity that is largely generated by burning fossil fuels like coal, oil and gas. " "When fossil fuels are burned, carbon dioxide is released into the atmosphere, which contribute to climate change. " Dr Wissner-Gross believes that Google's unique structure - which sees it send searches to multiple servers around the world and give which ever response is returned quickest - causes its searches to produce more emissions than some other sites. He told a newspaper: "Google operates huge data centres around the world that consume a great deal of power. " "A Google search has a definite environmental impact. " 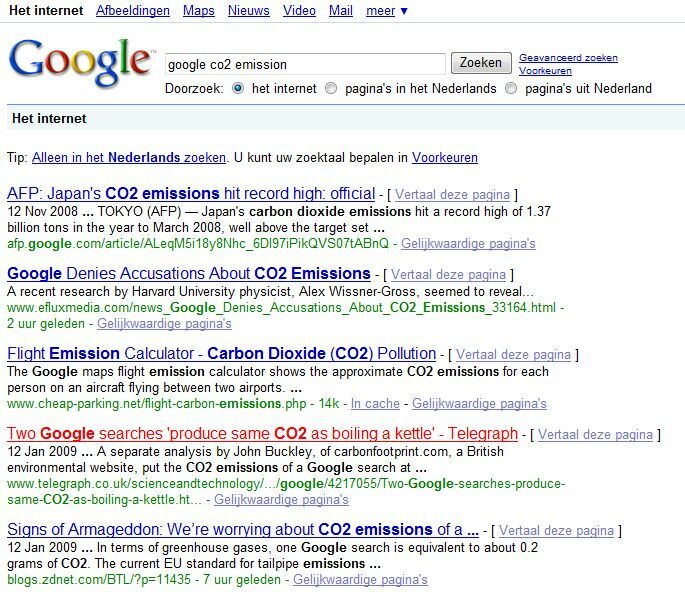 A separate analysis by John Buckley, of carbonfootprint.com, a British environmental website, put the CO2 emissions of a Google search at between 1g and 10g. Chris Goodall, the author of Ten Technologies to Save the Planet, said that assuming the user spends 15 minutes on their computer, the carbon emission of a Google is between 7g and 10g. Does it matter how much grams it is, it is not helping the environment, but what are the alternatives? Cut down the rainforest to satisfy our information needs by distributing all the blogs on paper? I guess not. You might encourage a lot of writers to just stop blogging and the world would be better off. I doubt we'll see that happening. Perhaps it's better to think how we can compensate. Have Google plant and other big spenders plant a forest to compensate, just like we've got to pay an additional tax for flying in the Netherlands. The only problem is.... Google and every other major player on the market is either American or China based, which means they don't really give a **** about the environment. Despite Al Gore and every greenie in the States, every environmental deal is blocked by the United States in favor of economic growth. Where did that bring us? It only brought global crisis. America has blocked deals like the Kyoto protocol so it could continue to produce supersized cars. It has only killed innovation and the United States are now putting billions of dollars into an outdated automotive industry. Cars are too big, engines to polluting for the present day world. No wonder nobody's buying anymore. In this second post in the Oriental Dispatch series, I'll introduce some more Japanese 3D virtual worlds. 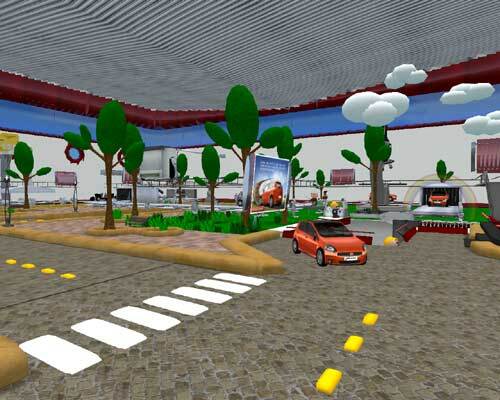 Splume is a 3D virtual world which has some interesting features. Splume is based on VRML. 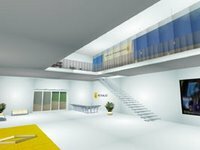 If you have some experience of making VRML, you can create your own rooms easily. Splume is offering Widget. 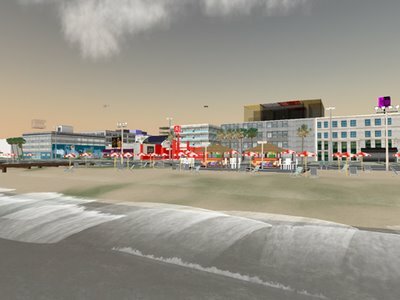 You can put your 3D world to your blog or website. 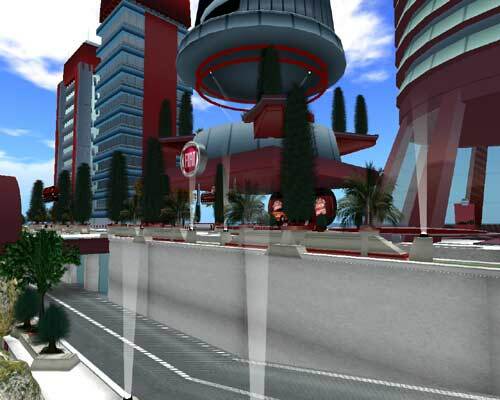 Splume is offering not only 3D virtual worlds but also SNS. 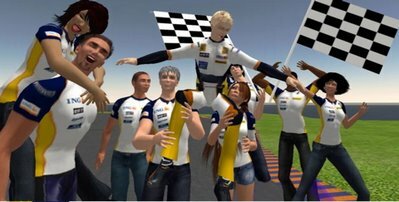 You know, it's not easy to find interesting peolple in 3D virtual world. SNS is a good way to solve this kind of problem. 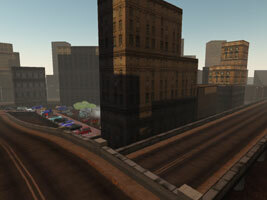 Meet-me is a virtual world offering a replica of Tokyo. 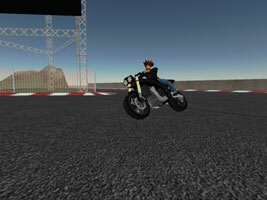 Users can edit their avatars, move around virtual Tokyo, enjoy chatting and get coins by playing games. It's possible to exchange coins to "Amazon Gift Ticket" which can be used at Amazon.co.jp. TOYOTA, a giant car maker, has a place called METAPOLIS in Meet-me. It has been promoting their cars. Recently younger generations in Japan seem to loose interest in cars. TOYOTA wants to attract youths by promotions in Meet-me. 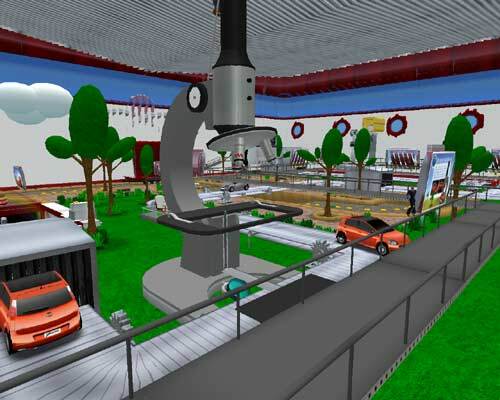 At Vizimo, you can easily create 3D games such as Maze, a fishing game or 3D hockey. One of Vizimo's advatages is supporting physics. In skimming the blogosphere a post caught my eye, which read: Mercedes-Benz ends Second Life test run with positive findings. The article in question was posted earlier today on the Mercedes Benz SL blog which had been quiet since august 2007. Seeing the inactivity at the blog for the last 7 months, this isn't a big surprise, but it doesn't mean Mercedes has been inactive in Second Life during these months. 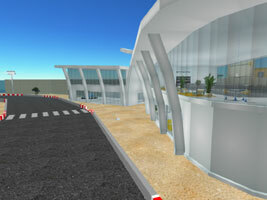 "A little over a year, Mercedes-Benz opened its dedicated presence in the virtual world of ‘Second Life’. 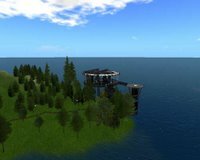 Since the launch of the brand’s virtual island, we won several vital insights and received plenty of positive feedback, especially for our unique communications policy. Over the course of the year, our brand avatar ‘Mercedes Milestone’ led more than 10,000 inspired dialogues. We truly enjoyed developing this new, innovative communications platform and would like to extend our thanks to all those who visited Mercedes-Benz Island and demonstrated interest in our virtual outpost. 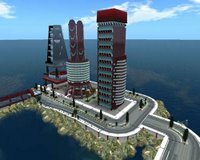 Our ‘Second Life’ stint will draw to an end on March 18th 2008 – as of this day, you will no longer be able to access Mercedes-Benz Island. 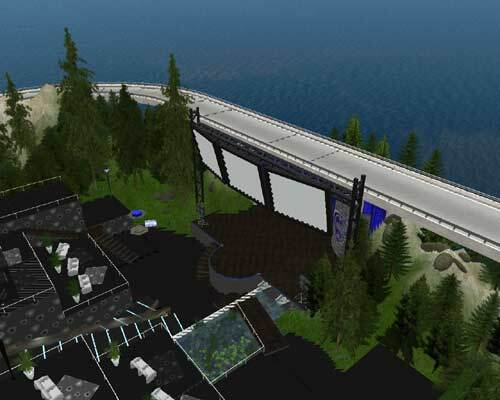 This brief and exciting foray into virtual communities brought us several essential realisations and the conviction that 3D worlds play a vital role as engaging communication channels. We will continue to monitor this theme and keep you updated on any new developments." Well, Mercedes has new insights. Good for them. 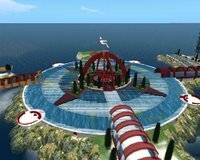 It is still a withdrawal from a virtual world, and the umpteenth withdrawal from Second Life which makes it very clear that companies still have a very hard time in making a usefull and persistent presence in a virtual world and that Second Life desperately needs to improve if it wants to play a role as a business platform. 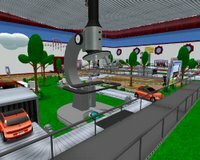 Second Life will degrade to being just another pimped 3D chatroom, a game with bad graphics or a chaotic placeholder for a surplus of user generated content no one needs. 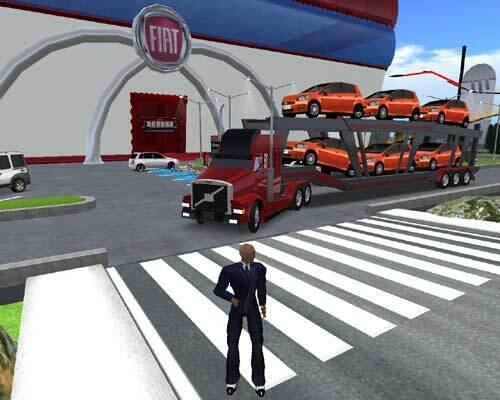 A little while ago I blogged Fiat Brasil in Second Life. Today I saw two commercials of the Fiat Punto. I liked the sense of humour they'd put into their Second Life presence. These two commercials also have a nice sense of humour. The first video is what I'd call inverted reality. Lancia gives SL the boot... were they ever in? 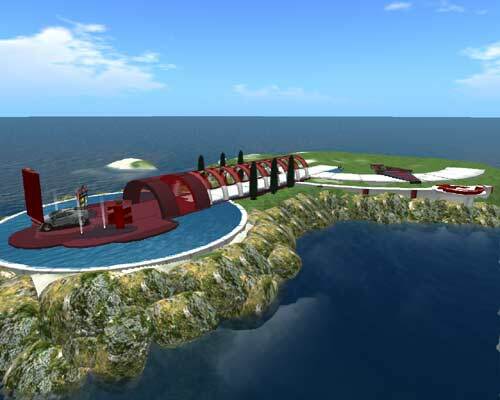 No they just entered Second Life, with their island bootshaped like their hometurf Italy. Last week I thought I had finished blogging every car company in Second Life when I did my post on Vauxhall but saturday the Italian Fiat subsidiary opened up their island to the public. 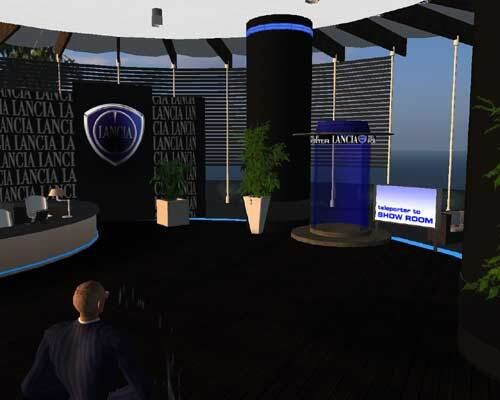 Island is a little deceiving here as their virtual showroom is quite a setup spreading 4 sims. 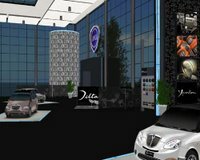 Lancia has created an Island in the shape of Italy, testifying to the brand’s commitment to spreading the made in Italy ethos. 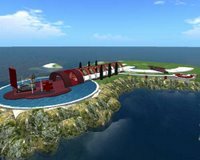 The island has 5 main buildings, 5 areas where you can experience our mood. To the North East there is the Reception, the ideal spot to start with to discover the island. To the North West, there is the Multi-Theatre, the island’s nerve centre, containing the Drive In and the Conference Room. In the Drive In area special content videos are waiting for you – you will be able to see them using QuickTime Player- with international artists such as U2, Zucchero, Peter Gabriel, Queen and Beyoncé playing the main roles. They were realized for 46664, the worldwide campaign against HIV created by Nelson Mandela, and they will be broadcasted on three big screens. where you can dance long into the night to the rhythm of the trendiest music around. 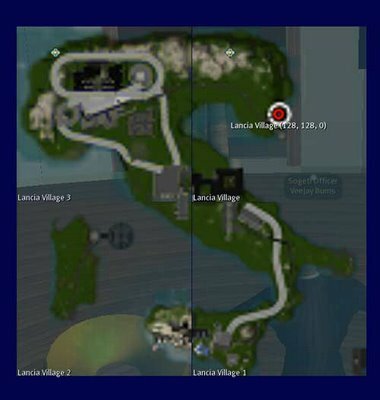 Lastly, if you go South, you will come to the Lancia Café, where you can relax with a drink or skip over the waves in a water-scooter. Discover the Lancia Village, a new way of seeing the world of Lancia, from a new, rather unusual point of view. As far as automotive immersions go, it isn't too different from what their peers have done. It's the usual press center and test track, but it has something extra with the videos and water scooter stuff. As far as design goes, it is Italian design which in this case means: It is a good build. I was actually impressed by a number of things. 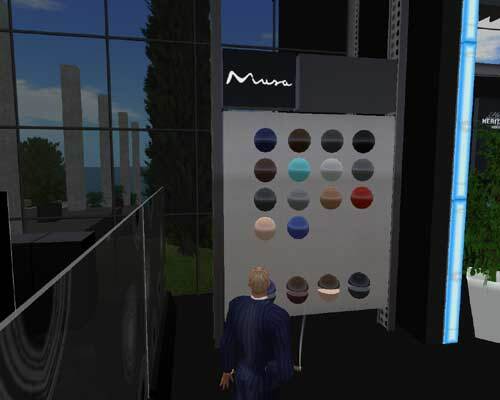 One of the things that really caught my attention was the colorboards next to the cars in the Showroom.. Alas, they didn't function as I had hoped. 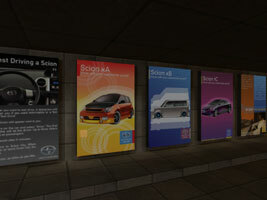 The boards display in which color the car is available. It would have been nice if they had been scripted to change the color of the car in the showroom accordingly when touched. 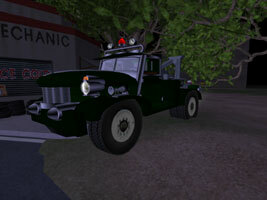 All car companies present in Second Life can be found through the automotive label on MindBlizzard. The reason why I've missed them is probably because they have decided not to build an impressive island with predictable features such as a racing track. 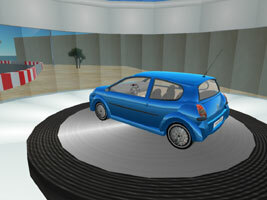 Vauxhall has created the Corsa Guide to Second Life. The Corsa Guide is a plain scrapbook showing favorite locations in Second Life, including places such as the Blarney Stone, Bora Bora Wavelabs, Acropolis Gardens, The Lost Gardens of Apollo, and the Bubblegum Music Factory. So, what are they doing? 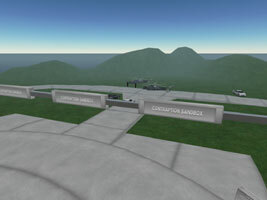 Well, strickly speaking, they are not (yet) launching an official presence inside SL, hence only the half. 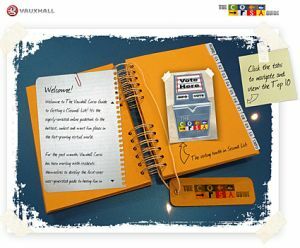 Instead, they are using ‘The Corsa Guide‘ as a tool to encourage residents to tag favourite places in SL and share them with other people. Apparently the top ten voted places in SL will be featured in forthcoming ‘Vauxhall Corsa Guide to Getting a (Second) Life. Nice. Shame they didn’t think to integrate some of their real world marketing efforts into SL." because Vauxhall didn’t seek to maximise this opportunity. C’Mon!" 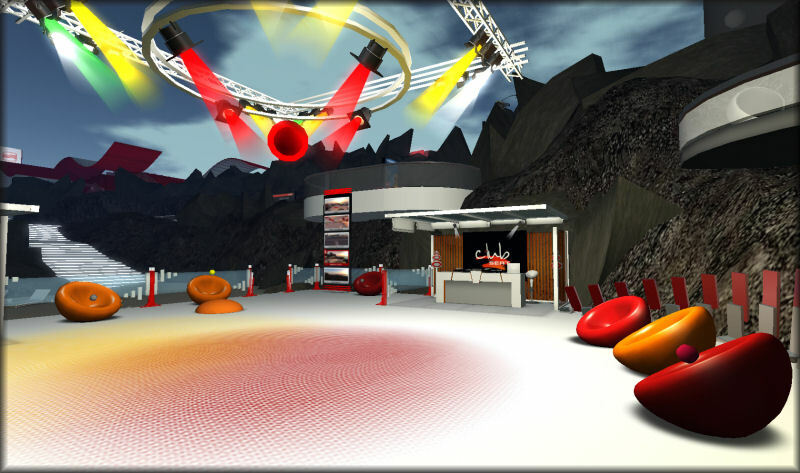 "Corsa is synonymous with having a good time and now we want to help people have fun 'virtually' too. It's a new world to explore, and it can be confusing finding your way around. This initiative will help newcomers find the best places to enjoy." 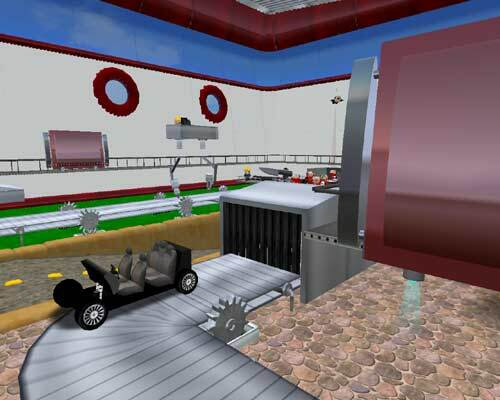 There are tons of blogs that pick the sweetspots in Second Life and I personally doubt the Corsa-driver-taste is fully compatible with mine. True, the New World maybe hard to navigate but I don't see it a car-manufacturers task to provide the hotspots. Companies such as The Yellow Pages, Navman, Tom-Tom or tour operators would be more logical candidates to service an approach like this. Whereas many companies are still having first, second or third thoughts about entering Second Life, the automotive industry keeps the engine running. This month saw the arrival of another French automotive company, Peugeot, making it number 9 or 10 to immerse. 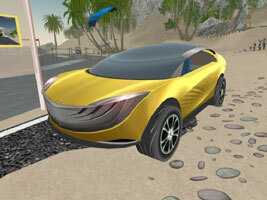 Quite in style with the latest trends the island is Logo-shaped, with the lion and the peugeot name. The island is dominated by a showroom which holds 2 floors and a roof. 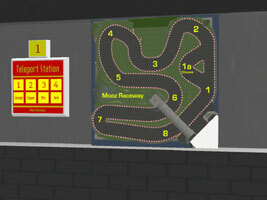 The main focus of this venue is on the 308 RCZ, which can be found on the ground floor and outside on the racetrack. On the second floor there's room for some concept cars and a presentation area, an auditorium. The roof offers room for informal meetings and parties. 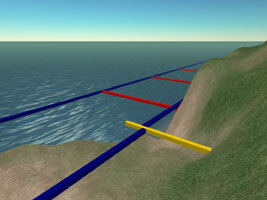 Throughout the sim is a deviously complicated racetrack, which basically is quite like the Mazda Hakaze track. Peugeot offers a freebie driving suit, but I couldn't get the 308 RCZ to actually drive. Some bends looked rather impossible, but hovering about I found out that the track is actually a tunnel. 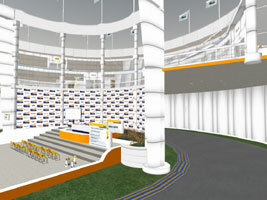 Invisible walls and roof have been placed over large parts of the track. 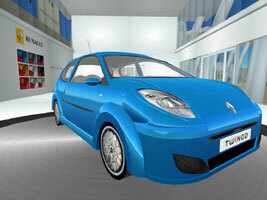 To wrap it up, it's nice to see another automotive company enter Second Life. The build is neatly done, but it doesn't offer much to the community. It's just another track. Most interesting to me was to see the concept car room. There should be more to exploit on that theme. Babyburns off breastfeeding, meaning I gotta stay up late and have a go with bottle and smelly powder milk. Usually it's around 11 pm and I sit down an watch some tv. Earlier this week I watched an episodes of a Discovery Channel show called "Rides" This one I especially liked since it featured a very special classic car, a Duesenberg. 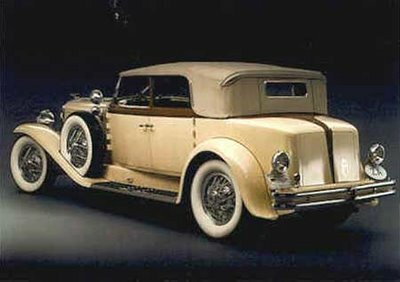 The Deusenbergs were two carbuilding brothers who build luxury automobiles and racecars in the early 20th century. There are several models of which only a few survive, driving prices up to millions of dollars for well maintained versions. The "Rides" episode featured Jay Leno, who is a classic car maniac, working on his Duesenberg. More on Jay's cars can be found at Jay Leno's garage. Well, at least the color is about the same. However, it means no money for a nice AC4, let alone a Deus. Anyway, as I said, I haven't gotten more than a virtual T-Ford sofar, but it would be fun to see such rare cars as the Deusenberg back in Second Life, being able to drive them. Have classic car ralleys and so on. From the mediterranean to the Copocabana is just one TP. The Copocabana houses a positively Latin metropole and several Brasilian companies. Brasil is doing SL Brasil style as it doesn't wait for the official international companies to arrive in Second Life, but follow their own branding and marketing agendas. 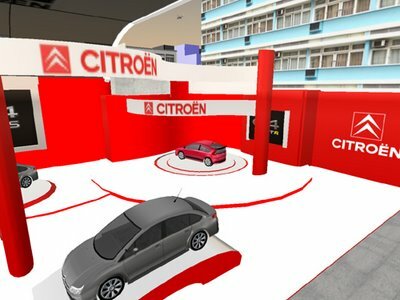 For several months Fiat Brasil has been under construction - and it should open soon - and now Citroën Brasil takes a / the stand as well. Following yesterday's post on this blog today's Things to Do event took place at the ING Renault F1 track and saw hectic moments. It's official that (metaverse blogger and group initiator) 57's virtual driving license has been revoked for trashing and drunk driving. The wild miss Gillian Waldman was disqualified for several false starts and certain bends caused real havoc. 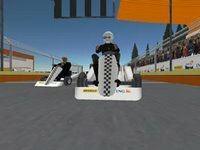 As to testdriving to sim, I noticed that at some points the track wasn't properly laid, at one point you couldn't get back on the track once you were out of it. Also, the go-karts are very direct in steering, causing some impressive moves to be observed. Today was ladies night however, and if you ever thought your wife looked handsome with her helmet on.... well, Misacha Vaughan looked stunning. 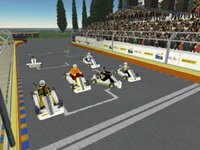 I'd like to see that more in F1 racing. If you like things to do, search for the group and team up! 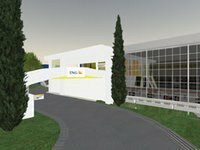 First of my Renault stops is the Renault Italia sim which is still under construction. 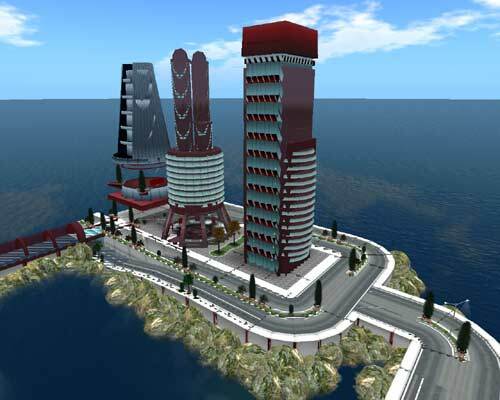 The sim is largely build by Virtual Italian Parks. This site is still heavily under construction, so I was amazed I got in. Only the parcel was set to limited access. being a Renault driver myself (yeah, I love Jag better but my wallet doesn't) I was interested to see what they've come up with. The sim is going to be the launch of the new restyled Twingo, which makes Renault the umpteenth Createur d'Automobile who uses SL as new model promo platform. 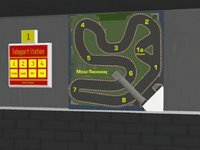 Aside from the Twingo show there's gonna be a racetrack and some other things that I can't see yet. Why Renault needs another racetrack is unknown to me, as they've got their testdrive lanes laid out at the ING Renault F1 sim as well. Tonight Zoe Visconti of Virtual Italian Parks contacted me to give some additional info. 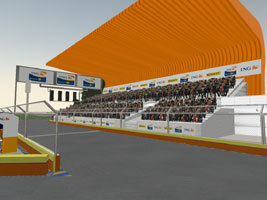 The sim is going to open next thursday (31 may 2007) at 21.00 CET, there will be an opening party and free twingos to ride on the track (and gadgets as well). So, logically. the second stop was the ING Renault Formula 1 site. Since it's a F1 day it seemed to be a good day to visit the sim, but it was rather empty. The build looks good though. 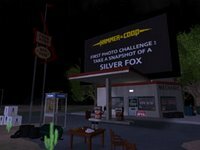 At the moment I was visiting and snapshotting the sim, Rivers Run Red CEO Justing Bovington contacted me and we had a nice conversation on various RRR builds. 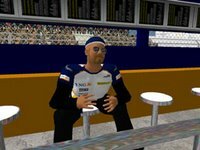 I noticed that the Renault Italia and the F1 sim were quite similar to eachother, but according to Justin that was purely coincedence. 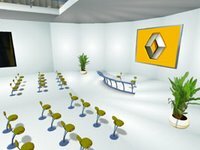 Renault Italia and Renault / ING F1 are completely different entities. According to Justin the F1 sim is a softlaunch and "activity is coming up, they have to run the Monaco event too as in the RL one." All in all, I totally like this build. More details on the build can be found at KZero's excellent blog. One last interesting piece of information on the Channel 4 sim, which I -and a few other bloggers didn't particularly like is that the"channel 4 build is interesting, its going to change a lot :)"
Today seems to be an endless blogging day. Next to style is another Millions of Us creation called "film". Again, this isn't a complete build. 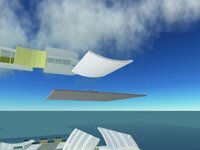 More like an entire sim is used for a 1024 m2 build. However, it wasn't a total waste of time. 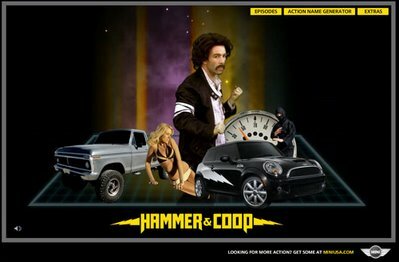 The sim is a sidekick in the launch of a new tv series, "Hammer & Coop" produced by MINI usa... Mini as in Mini-Cooper... the car. And yeas, after a shot at their website, I think I'd like to see a few episodes. The build is small, yet of quality. The series look good, and I'm hoping to see more of the series immersed into this Second Life sim, creating a neat experience. 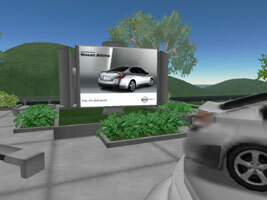 Mazda is adding another virtual promotion to the growing line of car manufacturers in Second Life. Since Toyota made a big launch in 2006 and Pontiac is praised everywhere for its crowdsourcing Second Life is hot amongst the iron-horse producers. So we've had Toyota, Pontiac, Mercedes, BMW, Nissan (and probably one I've missed) and Fiat under construction, you might have thought Mazda has had enough time to look at their peers and learned something from them, for good or for bad. 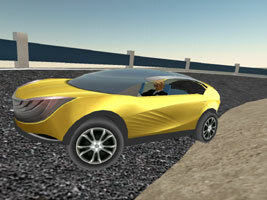 The presentation of the Mazda Hakaze at Nagara island was...well... a bummer. "Dagger rose. Silence. He sat and Barthelmess rose. He sat and Lundquist crossed to the podium. Still silence. A Mazda video played, then stopped and started again. Later another started. Neither video played to completion. Suddenly the Mazda Hakaze appeared on the oval, which had now risen a bit from its previous ground position. 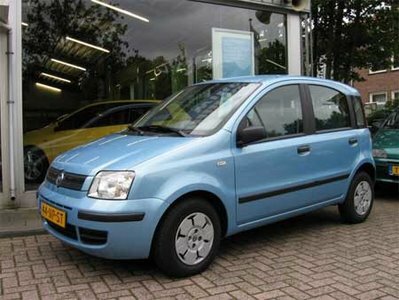 It’s a cute little car, has a bit of a smiley face front and I expected cheers, comments, anything. Silence..," said SLNN reporter Sarah Qi (read full article here). Mazda had been using group IM's to keep the gathered press up to speed, but had failed to tell them to use the group audio channel. Nagara Island is little more than a beach with a few roads to drive on. It appears Mazda bought the island in Januari 2006 and started building in February. Three employees have been inside SL but didn't bother to look beyond the borders of their own sim. Mazda plunged in without proper market research. They could have gotten away with that in early 2006, not in 2007! ING’s first-ever global marketing campaign was launched on March 15, timed to coincide with the first Formula One (F1) Grand Prix race of the season in Melbourne, Australia. ING was the title sponsor for the race and and is the main sponsor of the world champion Renault team. 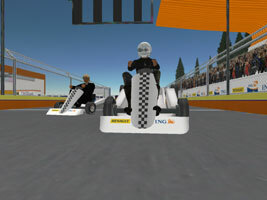 The Dutch bankers that brought us Virtual Holland are lining up their Formula 1 team in Second Life. Again they looked abroad to source this job. Rivers Run Red must have made a good impression as they're onto this one as well. The team’s SL build will “put enthusiasts and non-enthusiasts alike behind-the-scenes with a championship-winning Formula 1 team. 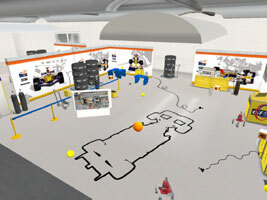 The experience is designed to take them closer to the dedication, technological excellence and teamwork required to achieve Formula 1 success, alongside a number of unique interactive virtual experiences.” according to a spokesperson. Somewhere in the vast virtual ocean you'll find a double sim, Misp and Moos. 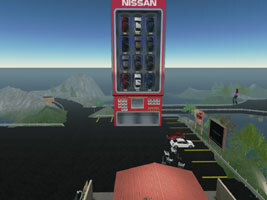 Nissan automobiles has created a 4 sim experience. On the first sim is the welcome area, with gadgets, a sandbox and a promotion show of the Nissan Altima (oh yeah, it's that good...). 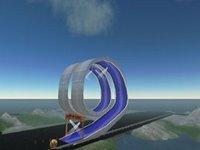 Aside from the main sim there's a 3 sim track you can testdrive, complete with looping. And then there's the skytrack... a very promising feat! Certainly a sim to come back to! 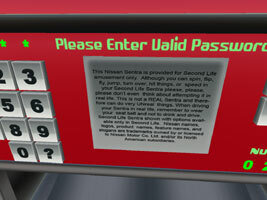 Toyota was an early arrival in Second Life. 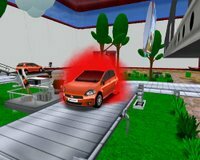 In 2006 they launched the Scion City sim to promote their Scion model. 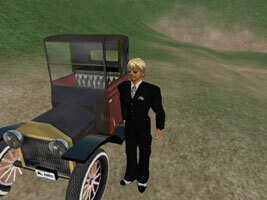 As was the case with the old internet, the automotive industrie is among the early adapters in SL as well. 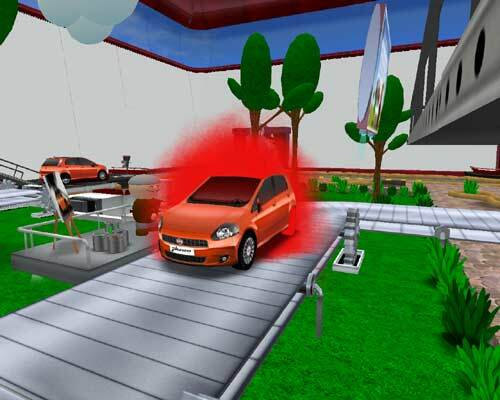 Visitors can customize their Scion and make a testdrive in a blockbusting urban sim. The skilled hand of Lordfly Digeridoo is easily recognised when one looks at the detail and style of the big innercity brick buildings which would fit any Motown company, but look a bit odd for the Asian carmanufacturer. 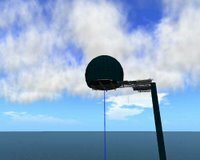 Perhaps Lordfly could elaborate on the idea behind this sim. One of the companies that literally drives the notion of crowdsourcing to the edge is Pontiac / Motorati. 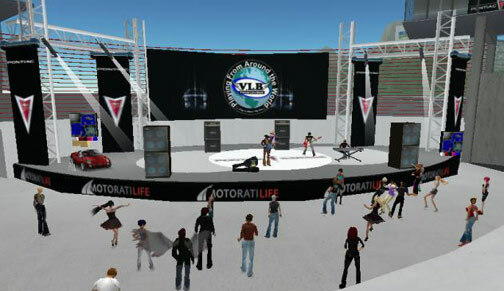 There's heavy interaction between the wonderful SL sim and their website (http://www.motoratilife.com/. 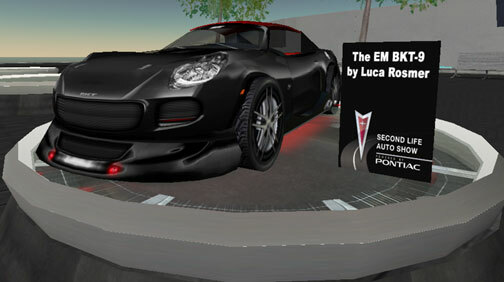 The sim is a buzz of activity with visitors designing new cars, dragracing and all sorts of car-centered events. Since the Pontiac Motorati cluster borders on the Millions of US development sites, it isn't hard to figure who build this great sim. Contrary to the stylish designs of the Dutch, the German design looks like they skipped the chapter on texturing. The designs of BMW and Toca Me are of a blinding white that will doubtlessly invoke instant snowblindness. Last Friday (16th) Mercedes launched their new 'C' Class car in RL and SL, and it seems to be something of a hit with the virtual petrolheads of SL. 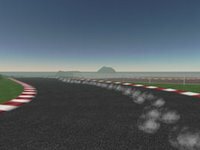 I popped along for a look earlier today, when there were about 20 such afficianados lining up to grab a car and zoom around the newly re-configured track, which now features a jump and a slalom to add a bit of zesty excitement to proceedings.